Next in my new occasional series on ISU’s oldest book in a subject area, I am examining our oldest botany book. 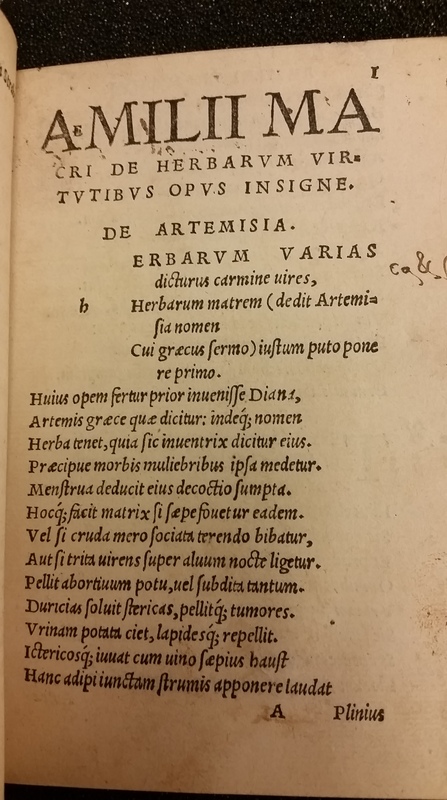 De herbarum virtutibus (Virtues of Herbs), by Aemilius Macer, is an early herbal, or book about plants that refers to their medicinal properties. Before the 16th century, botany did not exist as a branch of science apart from medicine. It wasn’t until three 16th-century German physicians published herbals whose illustrations and descriptions of plants was based on field work and not on the works of previous writers that the study of plants as a field unto itself began to emerge. Our copy of the Virtues of Herbs was published in Basel in 1527, but it was actually written much earlier, during the 9th century. Charles Loomis Dana writes about it in his book Poetry and the Doctors: A Catalogue of Poetical Works Written by Physicians (1916). This is one of a group of popular medical works from the medieval period written in verse. According to Dana, the author Aemilius Macer, also called Macer Floridus or Odo, likely lived in France and based his work on the writings of Pliny and other classical writers. His materia medica was popular for a few centuries after it was initially written. He describes the work as written in “bad Latin hexameters” that define the characteristics of 88 plants. The 1527 Basel edition is pocket-sized, perfect for field work, perfect for carrying for easy reference. And our copy is, indeed, much used. Some pages show stains, and there are underlinings and manuscripts notes in the margins throughout the text. 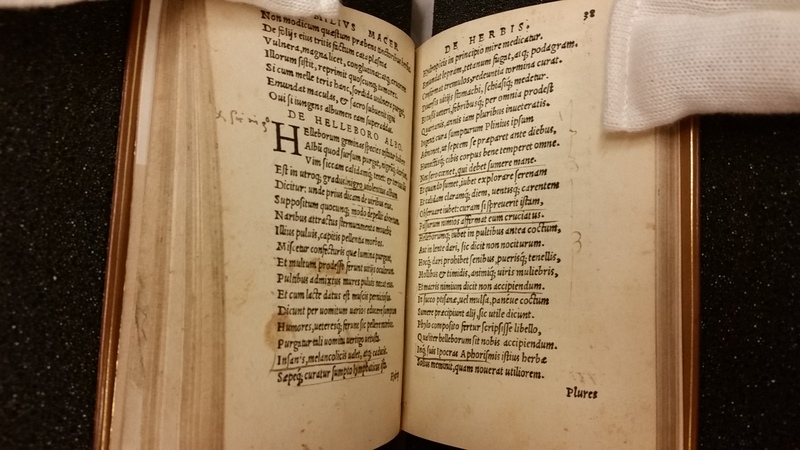 Pages from Virtues of Herbs, showing marginalia (that has been trimmed in a rebinding), and stains. It has likely been rebound–you can see that some of the marginalia has been trimmed–and the binding is mottled calf, a style popular from the 18th century on. 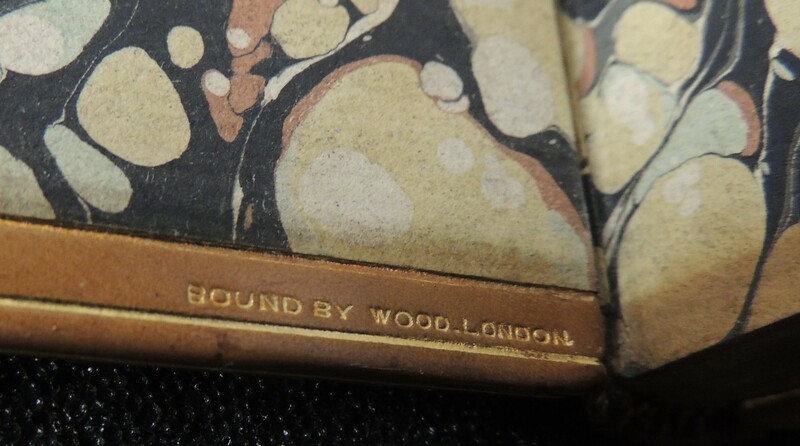 The binding also has a stamp “Bound by Wood. London.” A quick internet search leads me to believe that this refers to the London bookbinding firm of Henry T. Wood, established 1875. 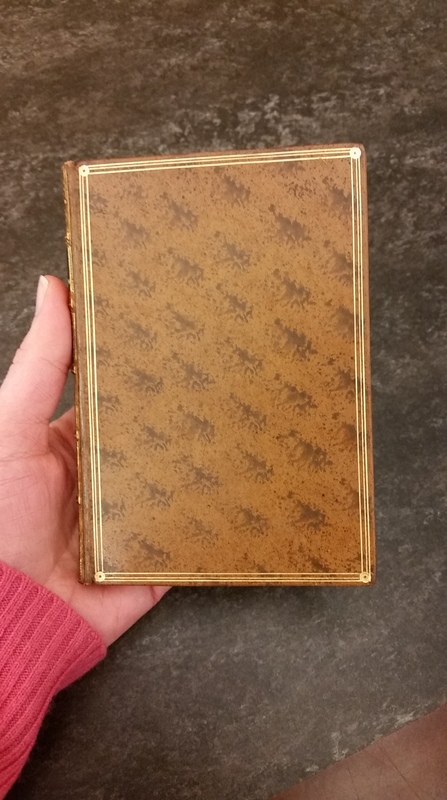 This firm did some eye-catching 19th century bindings, although this early one is less ornate. Dana, Charles Loomis. 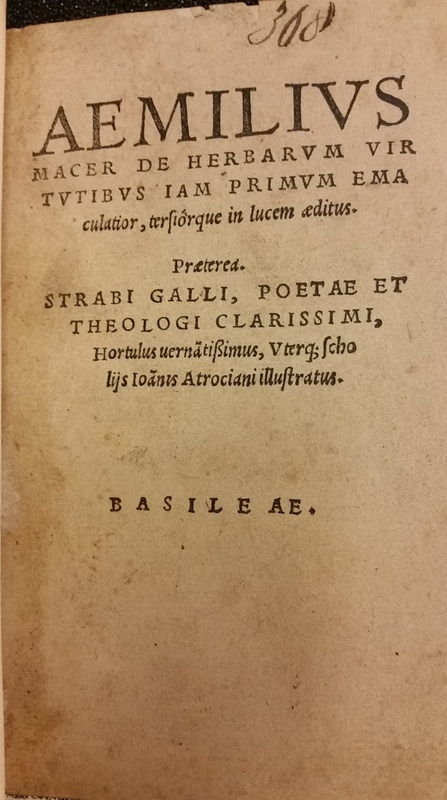 Poetry and the Doctors: A Catalogue of Poetical Works Written by Physicians. Woodstock, Vermont: Elm tree Press, 1916. 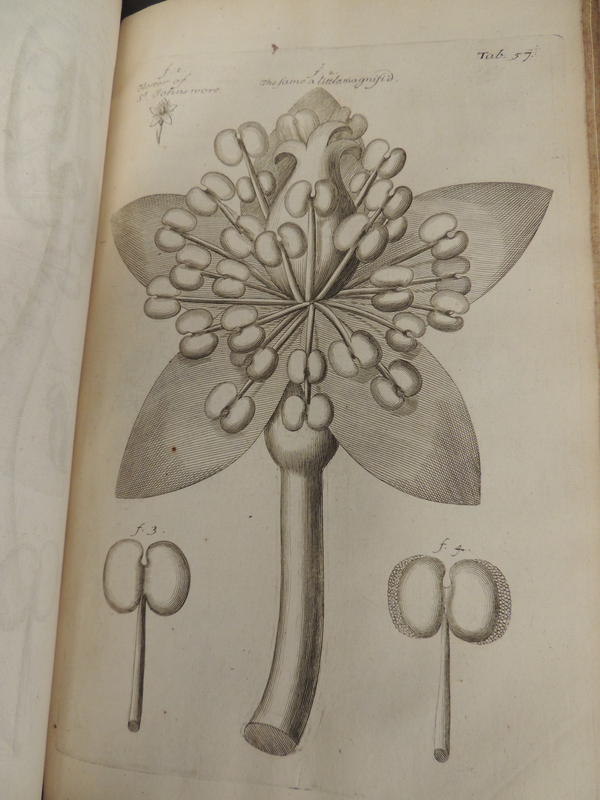 From the Nehemiah Grew’s dedication to King Charles II in The Anatomy of Plants. 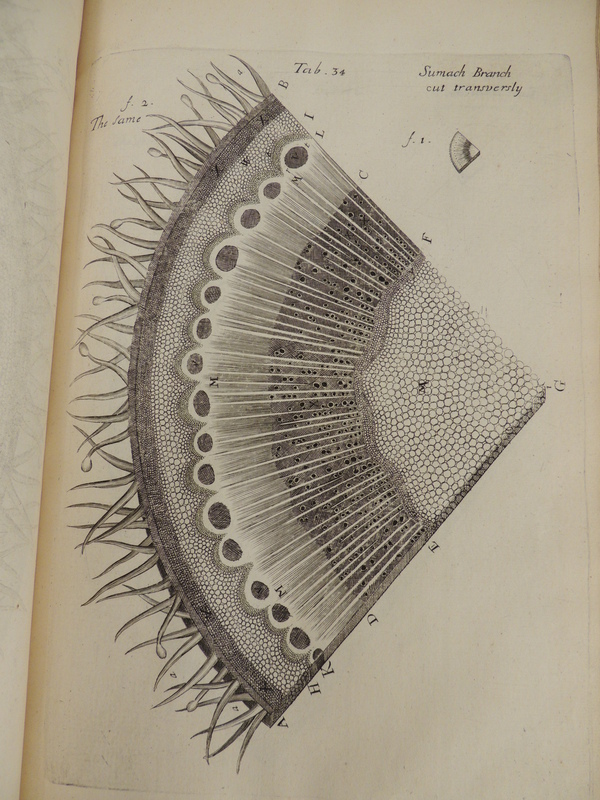 So wrote Nehemiah Grew in The Anatomy of Plants, published in 1682, in his dedication “To His Most Sacred Majesty Charles II, King of Great Britain, &c.” Looking at the beautiful and abstract plates illustrating the inner structure of plants, I sometimes feel I am peeking into a whole separate world, which is why Grew’s Anatomy of Plants (call number QK41 G869ap) is one of my favorite books in our collections. Plate from Grew’s Anatomy of Plants illustrating a sumach branch under magnification. Nehemiah Grew (1641-1712) was an English physician, son of the English nonconformist minister Obadiah Grew, whose oppositional religious and political views (he was a Parliamentarian during the English Civil War) frequently brought him into conflict with the authorities. Nehemiah, unlike his father, was not politically active, and, in fact, he was a member of the Royal Society, a scientific society that had been granted a royal charter by King Charles II in 1662. 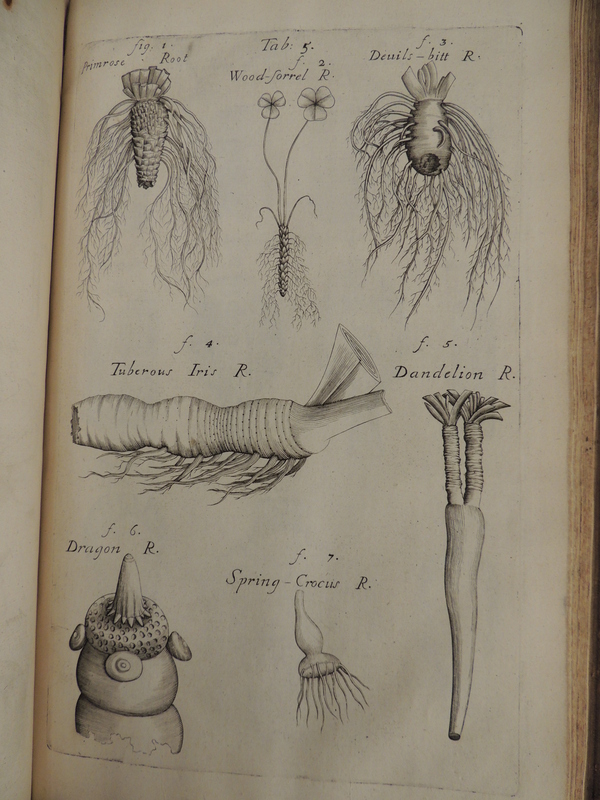 Illustrations of various roots in Grew’s Anatomy of Plants. Grew is famous for being among the first naturalists to use the microscope to study plant morphology. He was also believed that plants resembled animals in having organs that each had an internal function, and throughout the book he devotes chapters to the use of each of the parts of the plants that he identifies. This correspondence between animals and plants can be seen in his noted observations of the flower parts that he suggested correspond to male and female sexual organs. Plate of St. Johns wort flower under magnification from Grew’s Anatomy of Plants. Stop by Special Collections and University Archives to explore more of Grew’s “mappings” of the inner world of plants. Ada Hayden in College pasture, 1926. RS 13/3/33, Box 4, Folder 4. Hayden was born in 1884 in Ames, IA, and attended Iowa State College (University), where she worked closely with Professor of Botany Louis Pammel. She graduated in 1908 with a B.S. 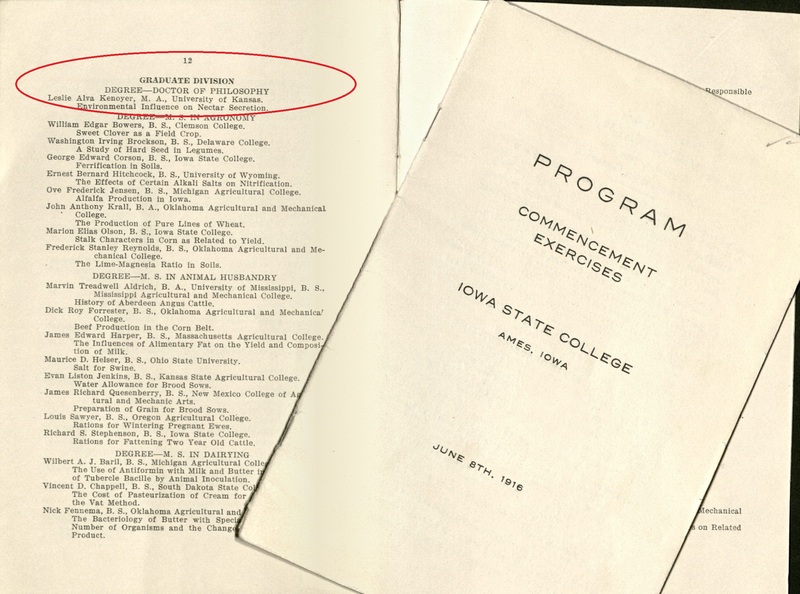 in Botany and later became the first woman to receive a Ph.D. from Iowa State in 1918. She spent her career at ISC as an Assistant Professor of Botany and was named Curator of the Herbarium from 1947 until her death in 1950. As curator, she collected and preserved plant specimens, but she also had spent much time drawing many botanical illustrations and photographing plants in their native habitats. She spent much of her later career working for the preservation of the few remaining native prairie areas in the state, and Hayden Prairie in Howard County is named in her honor. Rosa arkansana (Prairie Rose), Ada Hayden Digital Collection. The rose from the rosebud calls. You can read the entire poem by clicking on the image below. 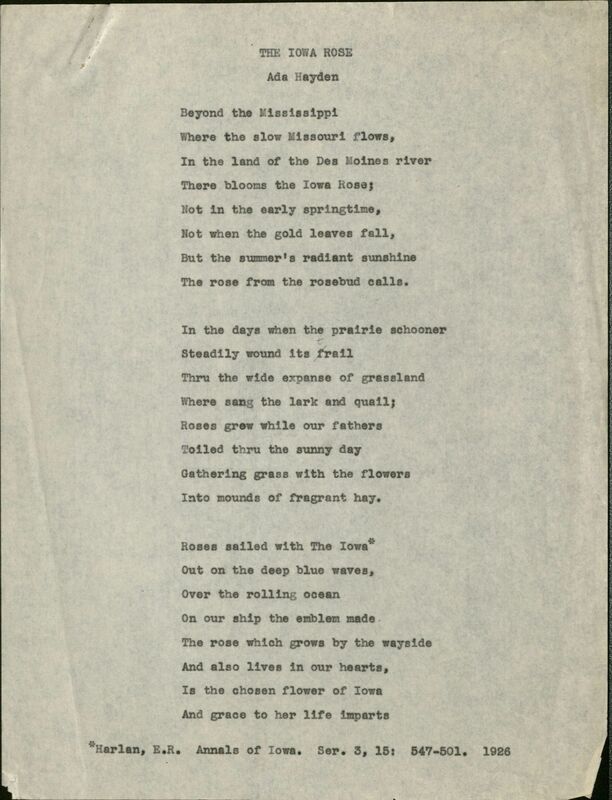 “The Iowa Rose” by Ada Hayden, undated. RS 13/5/55, box 1/folder 22. You can see slides of Hayden’s plant specimens in our Digital Collections. To see what else can be found in her papers, check out the collection’s finding aid. For our next coloring page, we have an illustration of a twig from a Jack Pine, by Ada Hayden. She was an early 20th-century botanist and earned both her Bachelor’s and doctoral degrees here at Iowa State. She also specialized in photographing and illustrating plant life. You’ll need a sharp colored pencil for this one – have fun! An illustration of a Jack Pine twig and pine cone, by Ada Hayden. RS 13/5/55, Box 5. Click here to download and print the page. Iowa was one of the first states in the United States to adopt a state park system, and it did so in large part due to the efforts of Iowa State professor of botany Louis H. Pammel. Louis Pammel (right) with Carl Fritz Henning, custodian at Ledges State Park, 1926. In 1917, the Iowa General Assembly created the State Board of Conservation for the purpose of making recommendations for acquiring land for state parks and to administer the parks. Pammel served as the Board’s first chairman from 1918-1927. 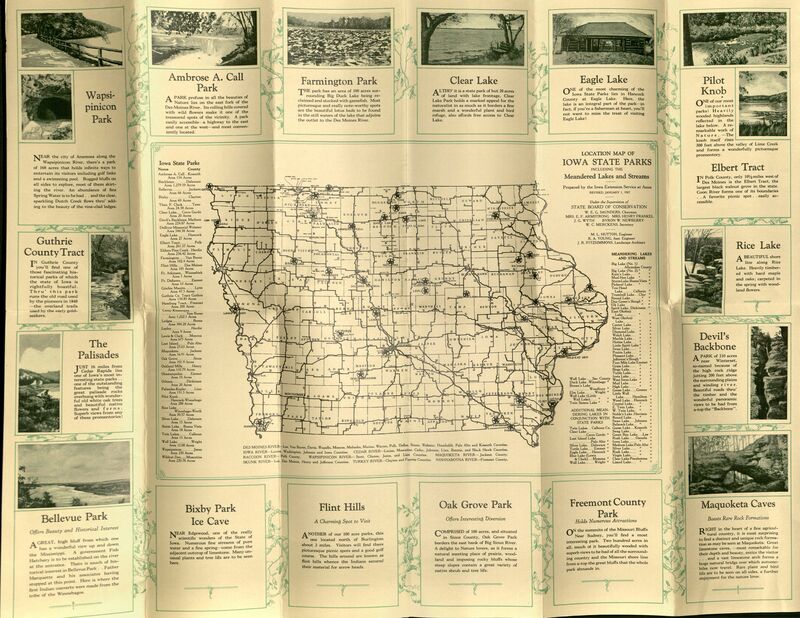 Under his tenure, Iowa acquired 38 state parks. Photo of Palisades on the Cedar River in Linn County, later Palisades-Kepler State Park, RS 13/5/13, Box 51, Folder 4a. Program from the dedication of Pammel State Park, 1930. RS 13/5/13, Box 76, Folder 8. On June 30, 1930, Pammel’s contributions to Iowa state parks were honored with the re-dedication of Devil’s Backbone State Park near Winterset in Madison County as Pammel State Park. Celebrate Earth Day by visiting an Iowa state park or other state park near you. Find out more about Pammel’s fascinating life (including his interactions with ISU alum George Washington Carver!) in the Louis Hermann Pammel Papers, RS 13/5/13. In honor of Martin Luther King, Jr. Day, it seems fitting to highlight Iowa State’s first African-American student and first African-American faculty member. 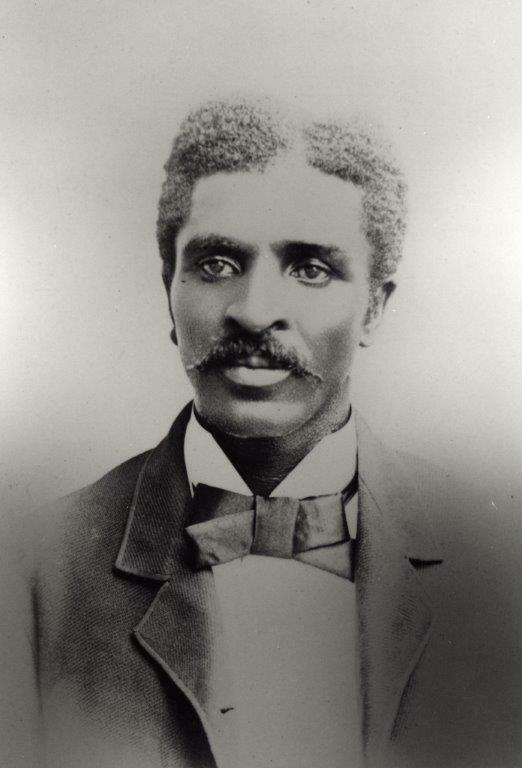 Beloved by peanut aficionados everywhere, George Washington Carver was born a slave and died a respected scientist and teacher. A building on campus is even named after him. He is best known for his work with peanuts, which resulted in 325 different products made from the legume. Carver became the first African-American student to enroll at Iowa State College (University) in 1891. He graduated with his bachelor’s degree in 1894 and earned his master’s in 1896, after which he joined the faculty at Alabama’s Tuskegee Institute at the invitation of Booker T. Washington. One additional note: Carver is thought to have been born around 1864 (the exact year and date is unknown), meaning this year likely marks his 150th birthday. Happy birthday, Mr. Carver! For a selection of our materials related to Carver, please see our digital collection and make a visit to the University Archives to view the rest of his materials. We hope to see you soon! The Special Collections Department here at Iowa State University holds numerous collections documenting the history of women here at Iowa State, throughout Iowa, the United States and sometimes even the world. A listing of selected collections related to women can be found in our subject guide found online. Ada Hayden taking a photograph. In the last few years, we have put a number of items related to women’s history from our collections online. One of these is a scrapbook from the Ada Hayden Papers which contains beautiful black and white photographs, including brief captions, of prairie scenes and flora in Iowa. In addition to being an Iowa State graduate, Ada Hayden was also an Instructor and Assistant Professor (1910-1950) of botany for many years here at Iowa State, and later Curator of the Herbarium (1947-1950). In addition to studying Iowa’s prairies and flora, she devoted herself to prairie preservation. Iowa State’s Herbarium was named after Ada Hayden, and contains many specimens collected by her. For more on the Ada Hayden Herbarium, please visit the herbarium’s website. You may also recognize her name from Ada Hayden Heritage Park on the north side of Ames. The finding aid for Hayden’s papers can be found here. The collection of quilt historian and Ames alumna Mary Barton is also available online through Digital Collections. The Fashion Plates Collection (1776-2003) contains plates of general fashion dating back to the 18th century and continuing through the 20th century. Mary Welch’s cookbook and several suffrage cookbooks can be found through the Cookbooks link on the Digital Collection’s homepage. Mary Welch was the wife of Iowa State’s first president, Adonijah Welch and was the organizer and head of the Department of Domestic Economy at Iowa State from 1875 to 1883. In addition to this cookbook, the Special Collections Department also holds Mary Welch’s papers. The finding aid to her papers can be found online here. Her collection contains interesting writings and lectures from an influential Iowa State woman from the early part of Iowa State’s history. The online suffrage cookbooks (the originals are housed here in the Special Collections Department) in the library’s Digital Collections are also are also fun to look through. The “Woman Suffrage Cook Book, containing thoroughly tested and reliable recipes for cooking, directions for the care of the sick, and practical suggestions, contributed especially for this work” was edited and published by Mrs. Hattie A. Burr in 1886. In addition to the normal sections of a title page still present today, I was surprised to find on the title page Hattie’s street address in Boston (or at least that is what I am assuming the address refers to)! The final online suffrage cookbook in our Digital Collections, “The Suffrage Cookbook, ” was compiled by Mrs. L.O. Kleber and published in 1915. In addition to the information and recipes this particular book contains, it also has additional value (sometimes referred to as “intrinsic value“) in that it was owned by our own suffragist Carrie Chapman Catt (Iowa State graduate and president of the National American Woman Suffrage Association). 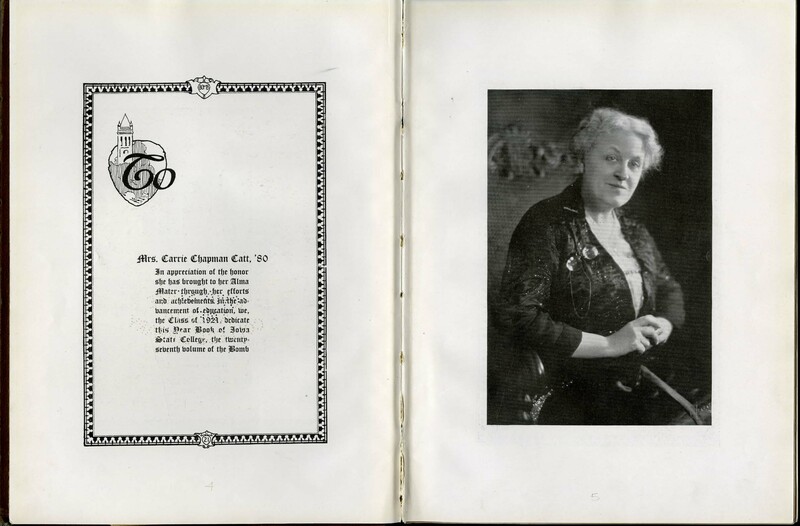 The book was once owned by Carrie Chapman Catt, and according to the note at the front of the book by her niece to Dr. Hilton [Helen LeBaron Hilton] “Aunt Carrie checked some of the recipes she liked and sometimes wrote figures on the side to show cost. Her own favorite desserts were cranberry souffle and strawberry shortcake-biscuit style.” An example of one of these checked recipes (Inexpensive Spice Cake!) can be found on page 124. Pie for a Suffragist’s Doubting Husband (page 147) is also an interesting read.